Acting British High Commissioner to Nigeria, Harriet Thompson, has noted that the call for restructuring of the country was a healthy one. Thompson tasked Nigerians to be united as they work towards peace and development. The High Commissioner stated this when she addressed newsmen on Sunday in Abuja on the occasion of the 57th Independence Anniversary of the country. According to her, ?I am really excited to be here, I find Nigeria an energising place to be in as it is full of opportunities. ?I come out of many meetings energised at the prospects that Nigeria has but I at times come out of other meetings less energized and a bit more pessimistic. ?Nigeria has obviously gone through the economic high and lows, rising and falling tensions, through military dictatorships to the solid and strengthening democracy that we see today. ?The UK?s relationship with Nigeria is long and broad. We work together now on issues ranging from trade, investment, commerce, education, infrastructure, health, security and the list goes on. ?We are committed to taking that relationship from strength to strength and to standing with Nigeria on this journey as it deepens democracy, improves security and creates prosperity. ?There are obviously issues that need to be addressed in Nigeria. ?Issues like corruption, issues like the insecurity in the Northeast, issues like the under-representation of girls in positions of influence and indeed the violence that many of them suffer on a daily basis. ?The Buhari government is committed to tackling many of those issues, and there are some incredibly impressive people working to address them. ?Challenges remain in Nigeria as they do in every other country of the world. ?I and the UK would encourage Nigerians to unite, to stand firm for peace and for unity to overcome those who wish Nigeria harm and to bring a safe and prosperous future for all Nigerians. ?I think the debate about restructuring is a healthy one to be had. ?It shows that the population are engaged in the politics of the country and care about how their country is run and what it gives to them. ?I would urge, as the government has done, for calm in how those discussions proceed and for measured responses in terms of language and activity. 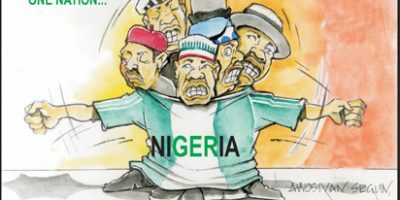 ?This is so that those legitimate political debates can be had in an atmosphere of mutual respect and of a mutual ambition to take things forward rather than to descend into violence which would be really unfortunate for a country like Nigeria. ?Take advantage of the differences, the huge range of people, of cultures, of landscape that we see in Nigeria. ?Nigerians should take advantage of the full variety that the country enjoys and I certainly would support the president?s commitment to tackling corruption. ?It?s something that comes up very frequently when we speak with business people who either are operating in Nigeria already or are contemplating coming to Nigeria, but with other actors as well. ?The commitment that the president has shown in tackling that issue is highly commendable, and we work closely with him and we continue to do so to bring his aims to fruition.? ?